All of the plastic parts for the machine on the right were produced by the machine on the left. Adrian Bowyer (left) and Vik Olliver (right) are members of the RepRap project. The RepRap project started in England in 2005 as a University of Bath initiative to develop a low-cost 3D printer that can print most of its own components, but it is now made up of hundreds of collaborators world wide. RepRap is short for replicating rapid prototyper. Due to the ability of the machine to make some of its own parts, authors envisioned the possibility of cheap RepRap units, enabling the manufacture of complex products without the need for extensive industrial infrastructure. They intended for the RepRap to demonstrate evolution in this process as well as for it to increase in number exponentially. 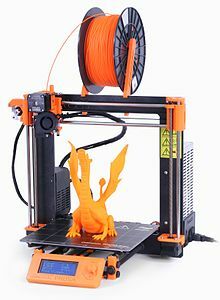 A preliminary study claimed that using RepRaps to print common products results in economic savings. RepRap was founded in 2005 by Dr Adrian Bowyer, a Senior Lecturer in mechanical engineering at the University of Bath in England. Funding was obtained from the Engineering and Physical Sciences Research Council. On 13 September 2006, the RepRap 0.2 prototype successfully printed the first part of itself, which were subsequently used to replace an identical part originally created by a commercial 3D printer. On 9 February 2008, RepRap 1.0 "Darwin" successfully made at least one instance of over half its total rapid-prototyped parts. On 14 April 2008, possibly the first end-user item is made by a RepRap: a clamp to hold an iPod securely to the dashboard of a Ford Fiesta. By September of that year it was reported that at least 100 copies have been produced in various countries. In April 2009 electronic circuit boards were produced automatically with a RepRap, using an automated control system and a swappable head system capable of printing both plastic and conductive solder. On 2 October 2009, the second generation design, called "Mendel", printed its first part. The Mendel's shape resembles a triangular prism rather than a cube. RepRap 2.0 "Mendel" was completed in October 2009. On 27 January 2010, the Foresight Institute announced the "Kartik M. Gada Humanitarian Innovation Prize" for the design and construction of an improved RepRap. The third generation design, "Huxley", was officially named on 31 August 2010. Development is based on a miniaturized version of the Mendel hardware with 30% of the original print volume. Within two years, RepRap and RepStrap building and usage were widespread within the tech, gadget, and engineering communities. In 2012, the first successful Delta design, Rostock, had a radically different design. The latest iterations used OpenBeams, wires (typically Dyneema or Spectra fishing lines) instead of belts, and so forth, which also represented some of the latest trends in RepRaps. In early January 2016 RepRapPro (short for "RepRap Professional", and one commercial arm of the RepRap project in the UK) announced that they are to cease trading on 15 January 2016. The reason given was congestion of the market for low-cost 3D printers and the inability to expand in that market. RepRapPro China continues to operate. Left to right back row: Bonnie (earliest E3D employee), Torbjørn Ludvigsen (maker of Hangprinter), E3D Online founders Dave Lamb, Joshua Rowley and Sanjay Mortimer, Chris Palmer (nophead Mendel 90), Christian, Clare Difazio. Left to right front row: Rongsheng Zhang (RepRapPro China), Greg Holloway (toolchanger and BigBox, Rory (E3D engineer), Adrian Bowyer, Mary, Sally Bowyer (Director of RepRapLtd) and Richard Horne. As the project was designed by Dr Bowyer to encourage evolution, many variations have been created. As an open source project designers are free to make modifications and substitutions, but they must reshare their improvements. RepRap has been conceived as a complete replication system rather than simply a piece of hardware. To this end the system includes computer-aided design (CAD) in the form of a 3D modeling system and computer-aided manufacturing (CAM) software and drivers that convert RepRap users' designs into a set of instructions to the RepRap hardware that turns them into physical objects. Initially two different CAM toolchains had been developed for the RepRap. The first, simply titled "RepRap Host", was written in Java by lead RepRap developer Adrian Bowyer. The second, "Skeinforge", was written independently by Enrique Perez. Both are complete systems for translating 3D computer models into G-code, the machine language that commands the printer. The closed source KISSlicer and repetier host are also used. Free and open-source 3-D modeling programs like Blender, OpenSCAD, and FreeCAD are preferred 3-D modeling programs in general for the RepRap community but, virtually any CAD or 3D modeling program can be used with the RepRap, as long as it is capable of producing STL files. (slic3r also supports .obj and .amf files). Thus, content creators make use of any tools they are familiar with, whether they are commercial CAD programs, such as SolidWorks and Autodesk AutoCAD, Autodesk Inventor, Autodesk 123D Design, Tinkercad, or SketchUp along with the libre software. A timelapse video of a robot model (logo of Make magazine) being printed using FDM on a RepRap Fisher, a delta-style printer. RepRaps print objects from ABS, Polylactic acid (PLA), Nylon (possibly not all extruders capable), HDPE, TPE and similar thermoplastics. Polylactic acid (PLA) has the engineering advantages of high stiffness, minimal warping, and an attractive translucent colour. It is also biodegradable and plant-derived. The mechanical properties of RepRap printed PLA and ABS have been tested and have been shown to be equivalent to the tensile strengths of proprietary printers. Unlike in most commercial machines, RepRap users are encouraged to experiment with printing new materials and methods, and to publish their results. Methods for printing novel materials (such as ceramics) have been developed this way. In addition, several RecycleBots have been designed and fabricated to convert waste plastic, such as shampoo containers and milk jugs, into inexpensive RepRap filament. There is some evidence that using this approach of distributed recycling is better for the environment  and can be useful for creating "fair trade filament". In addition, 3D printing products themselves at the point of consumption by the consumer has also been shown to be better for the environment. The RepRap project has identified polyvinyl alcohol (PVA) as a potentially suitable support material to complement its printing process, although massive overhangs can be made with using thin layers of the primary printing media as support, which are mechanically removed afterwards. Wood's metal or Field's metal: low-melting point metal alloys to incorporate electrical circuits into the part as it is being formed. Using a MIG welder as a print head a RepRap deltabot stage can be used to print metals like steel. The RepRap concept can also be applied to a milling machine and to laser welding. Although the aim of the project is for RepRap to be able to autonomously construct many of its own mechanical components in the near future using fairly low-level resources, several components such as sensors, stepper motors, or microcontrollers are currently non-replicable using the RepRap's 3D printing technology and therefore have to be produced independently of the RepRap self-replicating process. The goal is to asymptotically approach 100% replication over a series of evolutionary generations. As one example, from the onset of the project, the RepRap team has explored a variety of approaches to integrating electrically-conductive media into the product. The future success of this initiative should open the door to the inclusion of connective wiring, printed circuit boards, and possibly even motors in RepRapped products. Variations in the nature of the extruded, electrically-conductive media could produce electrical components with different functions from pure conductive traces, not unlike what was done in the sprayed-circuit process of the 1940s named Electronic Circuit Making Equipment (ECME), described in the article on its designer, John Sargrove. Printed electronics is a related approach. Another non-replicable component is the threaded rods for the linear motions. A current research area is in using replicated Sarrus linkages to replace them. The stated goal of the RepRap project is to produce a pure self-replicating device not for its own sake, but rather to put in the hands of individuals anywhere on the planet, for a minimal outlay of capital, a desktop manufacturing system that would enable the individual to manufacture many of the artifacts used in everyday life. From a theoretical viewpoint, the project is attempting to prove the hypothesis that "Rapid prototyping and direct writing technologies are sufficiently versatile to allow them to be used to make a von Neumann universal constructor". RepRap technology has great potential in educational applications, according to some scholars. RepRaps have already been used for an educational mobile robotics platform. Some authors have claimed that RepRaps offer an unprecedented "revolution" in STEM education. The evidence for such claims comes from both the low cost ability for rapid prototyping in the classroom by students, but also the fabrication of low-cost high-quality scientific equipment from open hardware designs forming open-source labs. ^ a b c Jones, R.; Haufe, P.; Sells, E.; Iravani, P.; Olliver, V.; Palmer, C.; Bowyer, A. (2011). "Reprap-- the replicating rapid prototyper". Robotica. 29 (1): 177–191. doi:10.1017/s026357471000069x. ^ J. M Pearce, C. Morris Blair, K. J. Laciak, R. Andrews, A. Nosrat and I. Zelenika-Zovko, "3-D Printing of Open Source Appropriate Technologies for Self-Directed Sustainable Development", Journal of Sustainable Development 3(4), pp. 17-29 (2010). ^ a b Pearce, Joshua M (2012). "Building Research Equipment with Free, Open-Source Hardware". Science. 337 (6100): 1303–1304. doi:10.1126/science.1228183. PMID 22984059. ^ a b J.M. Pearce, Open-Source Lab: How to Build Your Own Hardware and Reduce Research Costs, Elsevier, 2014. ^ Sells, E., Smith, Z., Bailard, S., Bowyer, A., & Olliver, V. (2009). Reprap: the replicating rapid prototyper: maximizing customizability by breeding the means of production. Handbook of Research in Mass Customization and Personalization. ^ Matthew Power (2008-09-23). "Mechanical Generation §". Seedmagazine. Retrieved 2010-06-04. ^ "Gada Prizes". humanity+. Retrieved 25 April 2011. ^ "Ingeniøren". Ingeniøren media. 2012-09-26. Retrieved 2012-09-26. ^ "RepRap Professional Ltd. is now closed". 6 January 2016. ^ Chulilla, J. L. (2011). "The Cambrian Explosion of Popular 3D Printing". International Journal of Interactive Multimedia and Artificial Intelligence. 1: 4. ^ "Pronterface, Pronsole, and Printcore: Pure Python 3d printing host software - kliment/Printrun". 2018-12-24. ^ "Ultimaker Cura: Advanced 3D printing software, made accessible | Ultimaker". ^ The importance of the Lyman Extruder, Filamaker, Recyclebot and Filabot to 3D printing Archived 2014-03-18 at the Wayback Machine – VoxelFab, 2013. ^ Feeley, S. R.; Wijnen, B.; Pearce, J. M. (2014). "Evaluation of Potential Fair Trade Standards for an Ethical 3-D Printing Filament". Journal of Sustainable Development. 7 (5): 1–12. doi:10.5539/jsd.v7n5p1. ^ Kostakis, V., & Papachristou, M. (2013). Commons-based peer production and digital fabrication: The case of a RepRap-based, Lego-built 3D printing-milling machine. Telematics and Informatics. ^ "I, replicator". New Scientist. 29 May 2010. ^ "RepRap—the Replication Rapid Prototyper Project, IdMRC" (PDF). Archived from the original (PDF) on 2012-04-06. Retrieved 2007-02-19. ^ Grujović, N., Radović, M., Kanjevac, V., Borota, J., Grujović, G., & Divac, D. (2011, September). 3D printing technology in education environment. In 34th International Conference on Production Engineering (pp. 29-30). ^ Mercuri, R., & Meredith, K. (2014, March). An educational venture into 3D Printing. In Integrated STEM Education Conference (ISEC), 2014 IEEE (pp. 1-6). IEEE. ^ Gonzalez-Gomez, J., Valero-Gomez, A., Prieto-Moreno, A., & Abderrahim, M. (2012). A new open source 3d-printable mobile robotic platform for education. In Advances in autonomous mini robots (pp. 49-62). Springer Berlin Heidelberg. ^ J. Irwin, J.M. Pearce, D. Opplinger, and G. Anzalone. The RepRap 3-D Printer Revolution in STEM Education, 121st ASEE Annual Conference and Exposition, Indianapolis, IN. Paper ID #8696 (2014). Replication revolutionary. New Electronics, 12 December 2006. Wikimedia Commons has media related to RepRap.